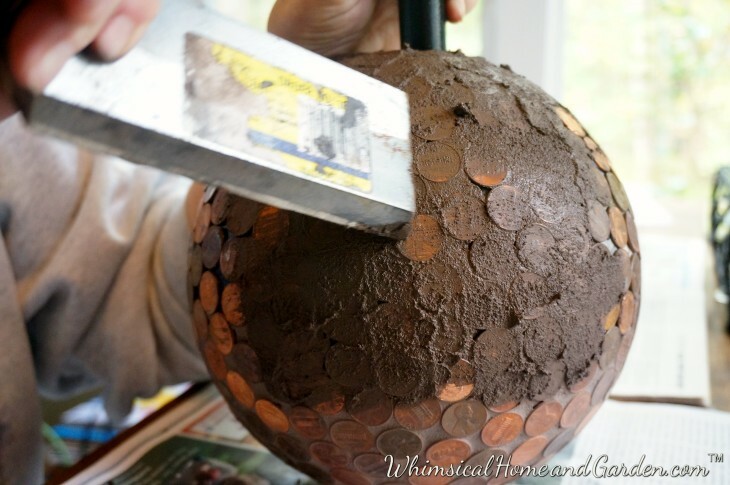 Here is a tutorial on how I finished up the penny ball by applying grout and sealer. I believe it makes a difference, both aesthetically and functionally. 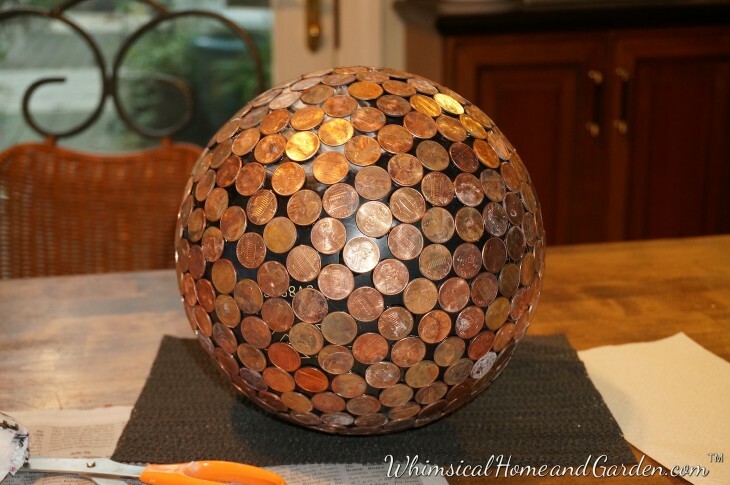 If you miss the tutorial yesterday on how to make a penny ball, you can read it here.. Penny Ball . 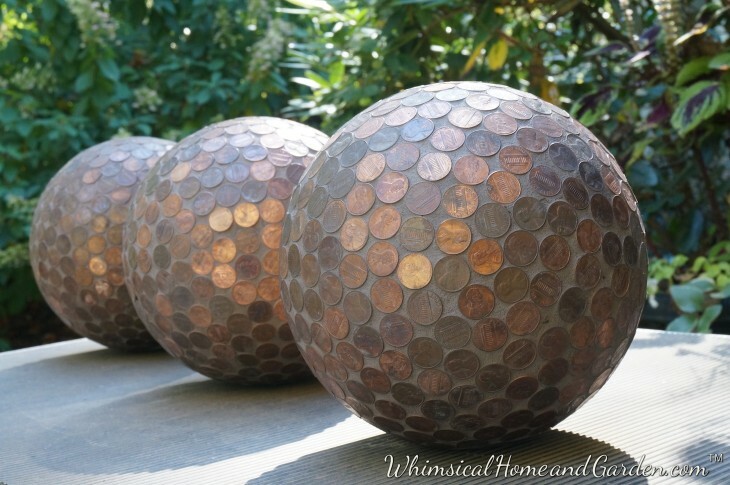 Tomorrow I will show you how I created some whimsical garden art using the balls and additional materials in what is now affectionately referred to as the Penny Ball Garden. KBJ….thanks for your sense of humor and help in installing my idea in the garden. 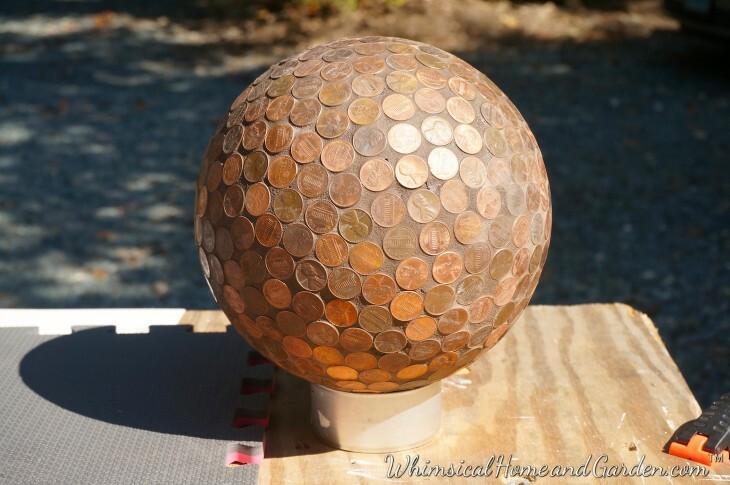 Here is the penny ball before grout. 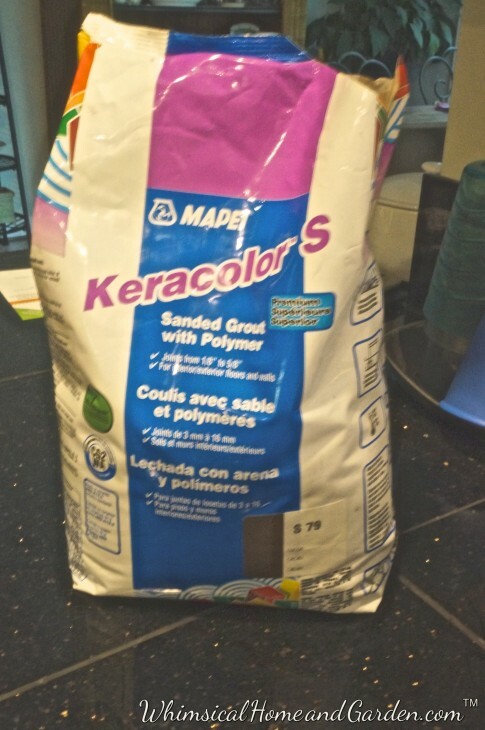 I chose sanded grout. I have done a lot of tiling over the years and Mape is my go to grout. 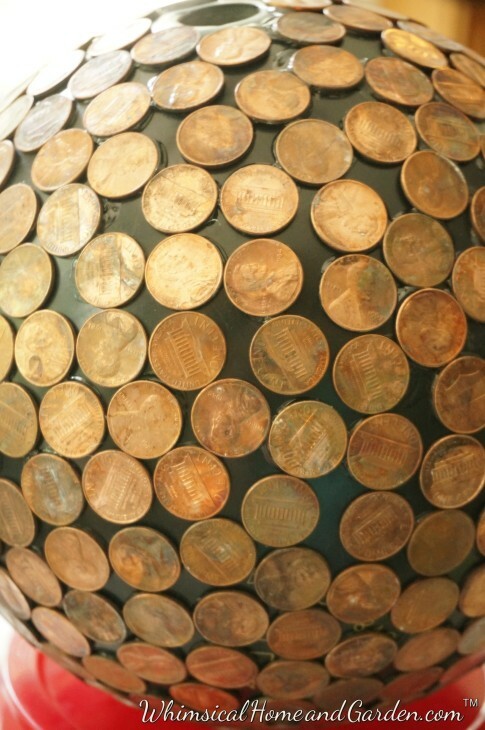 The color I chose was “CoCoa” to provide a background that blended with the patina of the pennies. 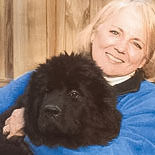 You will also need a plastic putty knife and rubber trowel, and a natural sponge used specifically for tile work. Applying the grout: Using a clean cottage cheese container, I used about one cup of powdered grout, then follow the directions on the bag, which after mixing instructs you to “rest” the mixture. Do not skip this step. 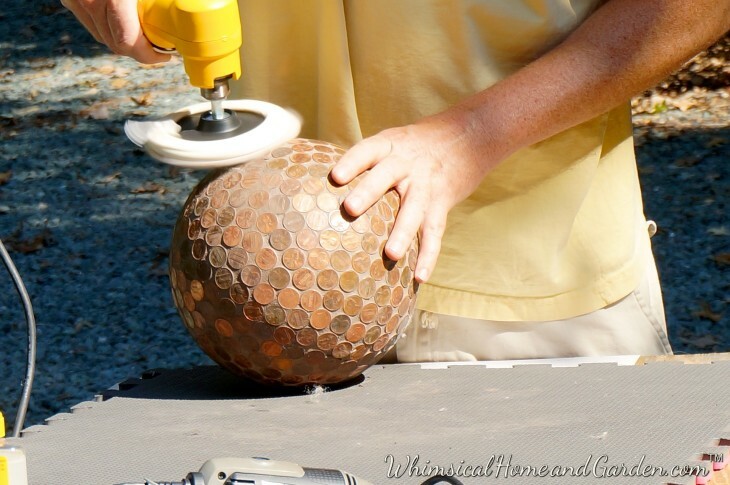 Using a plastic putty knife to spread the grout on one half of the ball. 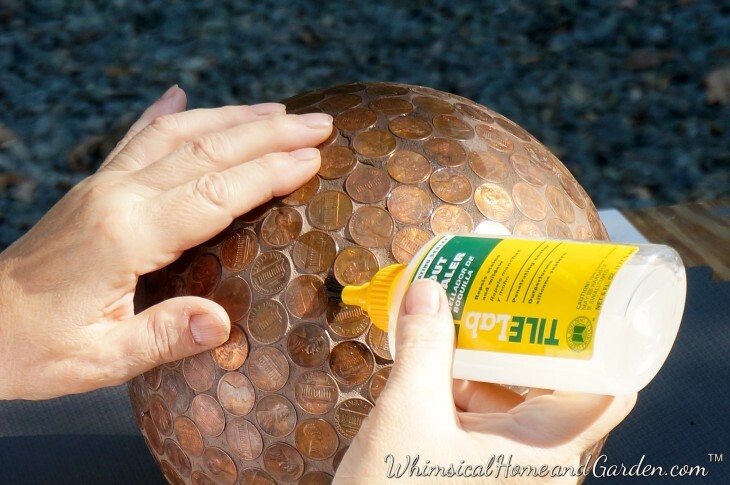 Then, using a small rubber squeegee, work it into the spaces and scrapping off as much of the grout as possible off the pennies. 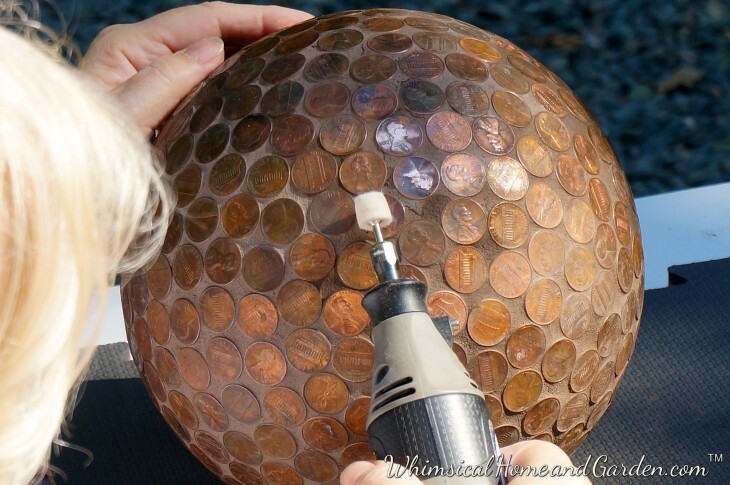 I did the top half of each ball, then let it sit until the grout was starting to set, anywhere from 10 to 30 minutes. 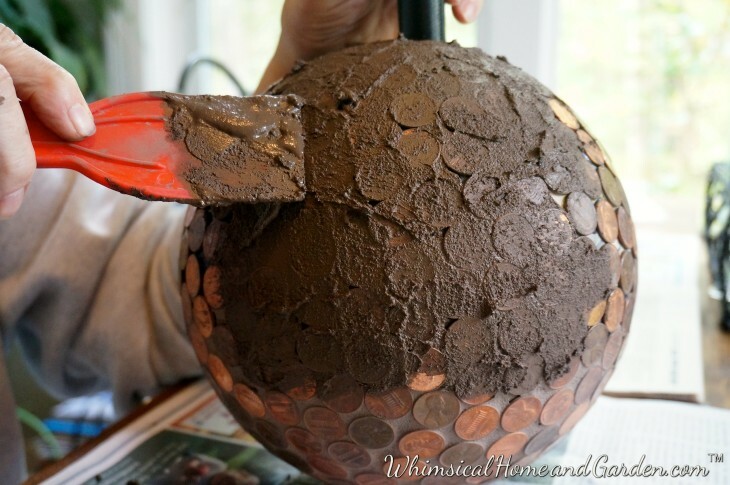 Then wet your sponge, squeeze all the water out, and lightly go over your grouted space, both cleaning your pennies, and smoothing out your grout spaces. One or two swipes and you need to rinse. You also need an especially light hand or you will pull out your grout. After you have cleaned off the group, let dry for a bit, and a haze develops indicating it is time to buff it clean. I use old shoulder pads….they worked especially well for the size of the project. I waited a couple of hours, then did the other half of each ball. Here you can see one half grouted, done and dried…….ready for the finish job. You can see that there was some grout left on some of the pennies, and I wanted to clean it off and buff the grout film off before I sealed the grout. Doing it this way was effective but slow, so KBJ made a suggestion. He suggested trying a buff pad and it worked and made a quick job of getting the rest of the grout haze off. Tile Lab in my opinion makes the best sealer. In my shower, which is marble, the tile and grout still beads up after more than 9 years. Usually you would pour it on, this is such a small project, I used this bottle which come with a mini brush. I squeezed a little on, and used the brush to move the flow into the grout. I even used my finger to move it around, as the pennies did not need the seal. More directions are on the bottle. After it dried for a couple of hours, I went and tried to put more on, but it beaded up, so I knew it was sealed. Hi, You can try clear lacquer, but I would make sure that it specified for exterior use. I went back and put grout sealer of the joints of a couple of my balls. If I were to do the balls again, I think I would forgo the grout and use epoxy for the entire thing if I could determine it would work outside. My balls lasted pretty well until this year, when the pennies started to pop off. That said, I left mine outside all year, not a good idea, as the composition of a bowling ball must expand and contract. Also with damaged balls, which I used, the freeze thaw cycle expanded cracks. I would suggest bringing them in over the winter. Still, they lasted a long time in the extreme weather, especially in the heat of the mid south. 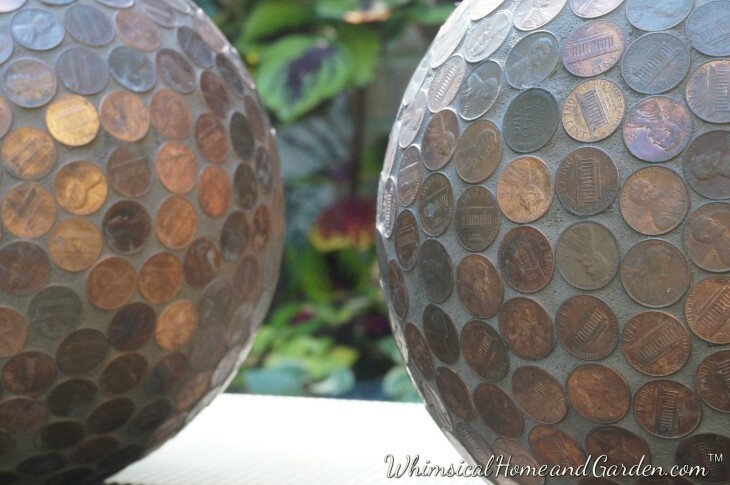 Hi Charisse, I’ve made 2 grouted penny balls. Thanks for the inspiration. I like the look of the grout but I like epoxy idea. I made the 2nd one as an anniversary gift, using pennies with significant dates. I had hard time deciding if I should spray it with a sealer to prevent pennies from tarnishing but ended up just using the sealer for the grout only. 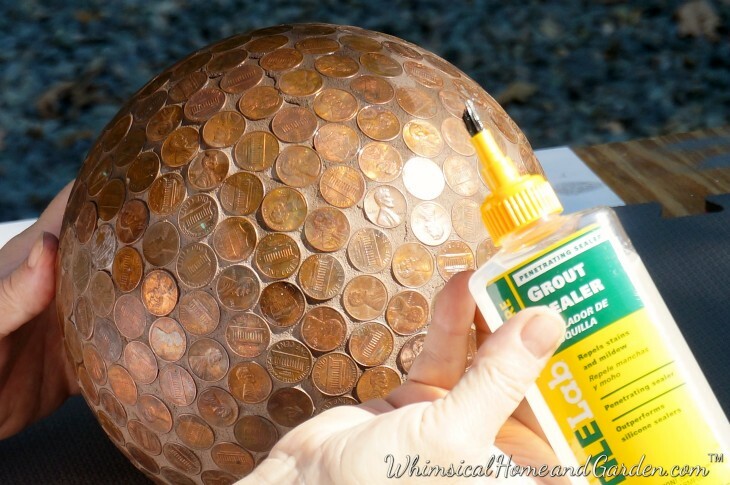 When you say forgo the grout, are you thinking of gluing the pennies on and then covering with epoxy as in epoxy resin? I was thinking about epoxy resin, although I am not sure that it would protect it in cold/freezing weather anymore than just sealer. I would definitely bring them in in cold temps as the balls do expand and contract. 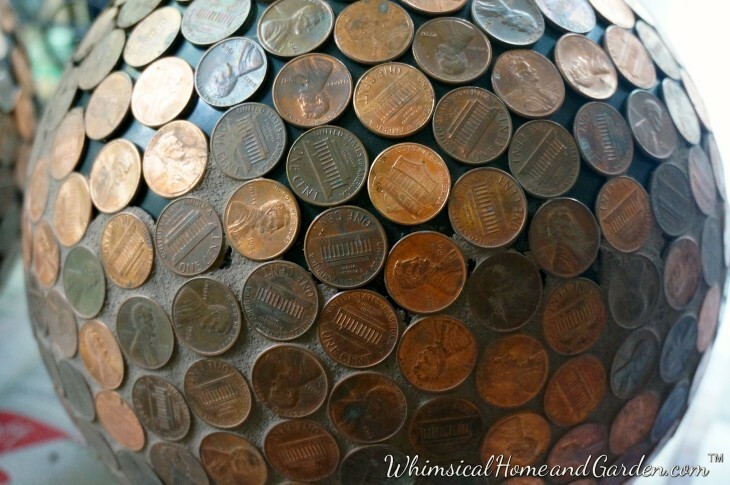 Mine lasted outside for many years all seasons but finally the pennies started popping off. I love your idea of using pennies with significant dates! 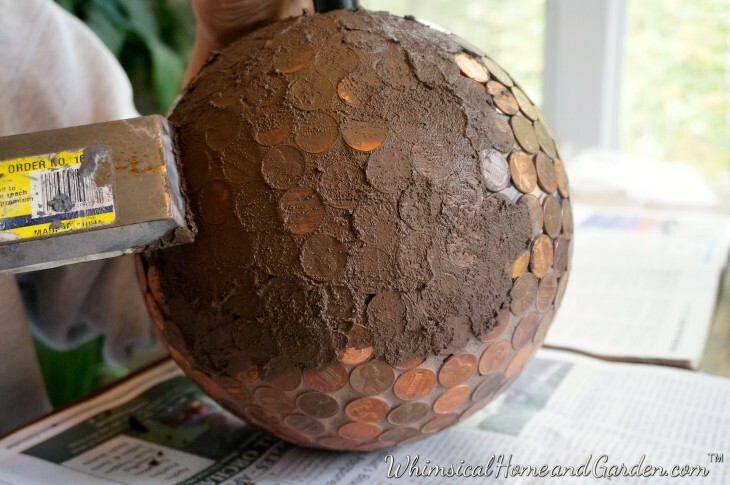 That would be a penny ball to cherish and I would display inside. I have been looking into smaller sized balls, bowling or otherwise to use as well. Thanks for sharing your experience. I am sorry that I am just now getting back to you. The comment was for an older post and I simply did not droll down far enough to find it. Please accept my apologies. The quick answer is NO, a basketball will not work. No soft ball, or any ball that needs air. It has to be a very hard surface that can take a marine level glue, as well as the weight of the pennies. 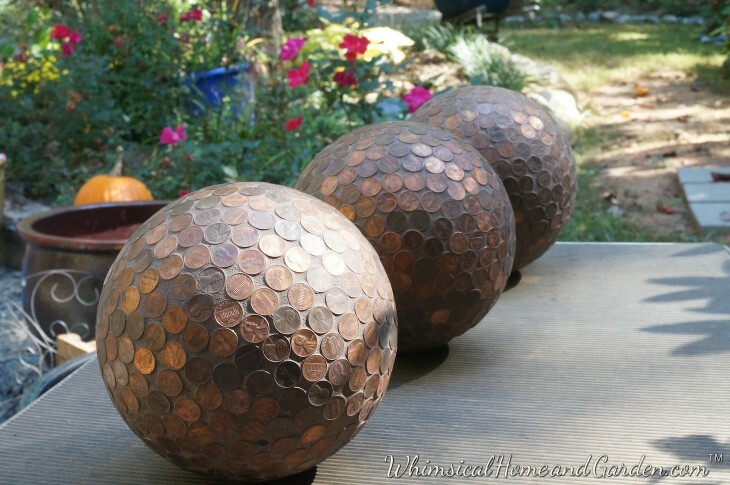 I am happy to say that last winter was one of the coldest, and a rainy spring, and the penny balls are all in good shape! Bowling balls can be found at flea markets or Goodwill for just a few dollars. Even though you have to fill in the holes, it seems to work the best. Hope this helps. I love this! You are so resourceful and do a great job of the step-by-step. Thank you! I try and make it as easy as possible for someone that wants to give it a go. My goal with doing the blog is to be encourage people to just give it a try if they are so inspired. Taking everyday items and repurposing them has always been fun for me. Can’t wait to see the end result! What a creative brain you have…so talented. You are very sweet. I have had fun doing this, and especially being able to integrate it into the new garden area.